Behind the Bit: Eternal youth or arrested development? Eternal youth or arrested development? What's your favorite horse color? "I'm so glad to have met you. You're a very interesting young person!" No, I'm not a precocious youngster. Should I tell her I'm probably a dozen years older than her? No sirreee. I'd rather leave Jill with a favorable impression of me as an overachieving teen than weirded out to hear I'm a 46 year old stuck in the horsey-ga-ga stage. Here's an analogy. Woody Allen wrote a story called Remembering Needleman about an absent-minded professor who delivers a lecture to his scholarly peers. After the lecture he discovers that he neglected to remove the coathanger from his suit coat before putting it on. "Good," he says. "Let those who have taken issue with my theories think at least that I have broad shoulders." Needleman didn't reveal he was wearing a coathanger, so I'm not volunteering my advanced age. Okay, maybe it's not the best analogy. But I love that line in Needleman and it's a good excuse to share a laugh. Heh..I'm not sure if I should admit I play horseland or not. As well as one of my older guy friends who takes pride in having one of the highest pointed lines of SEA's on the game. "Why do flamingos turn pink?,"
"Pink flamingo ribbon tote bag." That last one scares me! Rattitude, fess up now -- is it fun? Do I dare confess I was tempted to join? I just found you today via EC. So happy to find a blog about horses I've given you some awards. See them on my blog. I admit to having a Howrse.com account. Virtual horses are the only ones I can afford at the moment! I have to say, I too once played that game HorseLand. It has changed a lot since I did, and now is dominated by the pink fluffy pony loving youngins. It did have an appeal to it and the community was vast and at the same time "small." It was quite interesting and was fun for more reasons than just playing with sim horses. 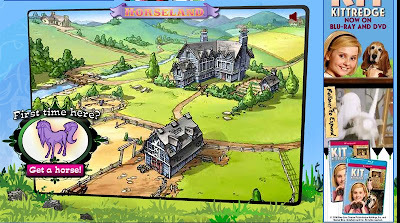 I'll have to admit that I too played Horseland once upon a time (like 10 years ago). It was good back in the day. I too "bred" so very nice SEAs and SSAs... had some incredible lines. Then I forgot about the game (real life, ya know) and all my "horses" died. Still have that account and it's still "active" - it's a lovely four digit number too! Oh, and I'm now addicted to Howrse, thanks to CoTH. It's a great game and only takes me about 15 minutes to "play" each day. ETA: I can't spell today... it's Friday!